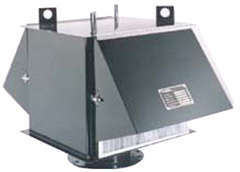 Capacity of 2500 CFM at an initial pressure differential of 1.1" W.C.
Nominal size 24" x 24" x 2", weight 11 lbs. The 1SPIF Series of inlet filters are single stage panel inlet filters for removal of airborne particulate. Their primary function is to protect blowers, axial compressors, small turbines, diesel and gas engines. All steel weatherproof housing, powder coat painted suitable for outdoor installations. Low in draft velocity weather hoods. Premium pleated dry panel filter elements - VP-104-005- provide 98% removal of 10 micron particles with a minimal pressure drop and high dirt holding capacity.